Eighty-two channel TV outlet with 75 ohm input/output and 12V DC receptacle. 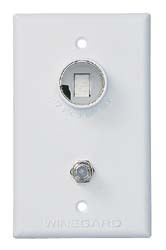 Flush mounts in a standard electrical box. Ivory. 1/pack.